A summer guide to dark and sizzling Shakespeare | Daily Review: Film, stage and music reviews, interviews and more. In 2016, we mourned en masse the deaths of Bowie and Prince on social media, but 400 years ago, the death of another pop culture icon, Shakespeare, on April 23 1616, went largely unnoticed. His First Folio of works would not be published for another seven years. Here in Australia, that publication’s centuries of British soft cultural power have reverberated since the colony’s earliest days, and will do so again this summer. But why? As I sat in a theatre last month at the Bard’s birth and death place of Stratford-upon-Avon, north of London, watching a hi-tech production of The Tempest, I was struck how modern in its quest for hopefulness was the story of magician Prospero (Simon Russell Beale) and the sprite Ariel (Mark Quarterly). A platonic queer love story, of sorts. “Do you love me, master, no?” Ariel asks the magician. “Dearly my delicate Ariel,” says Prospero, but spoken as though the notion may have occurred to him for the first time. The first play in the First Folio but the very last credited solely to Shakespeare and written towards the end of his 52 years, this latest Tempest was modern in the spectacle sense, as well. 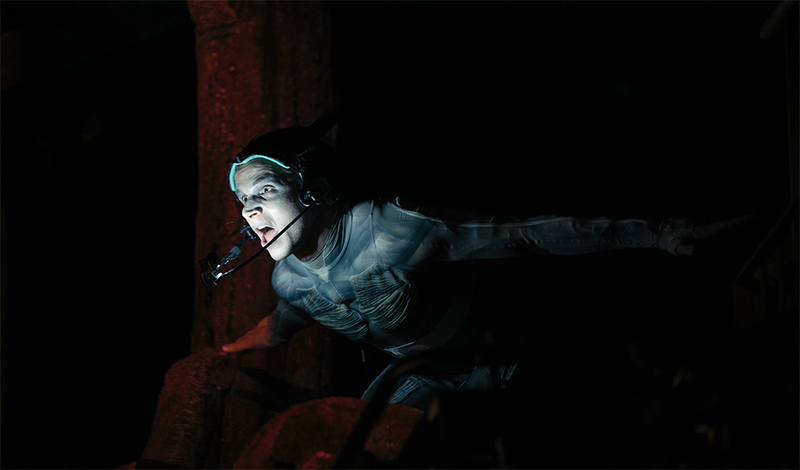 Twenty-seven projectors atop the innards of a shipwreck hull were relaying the side-stage dancing of Ariel in a motion-capture suit in morphing three-dimensional avatar spirit forms high on centre stage. International audiences can judge the technology’s efficacy for themselves when a filmed version of this stage production hits cinemas, in Australia in early March. Moreover, with its emotional gravitas of Prospero renouncing the dark art of manipulating the oppressed, the play gives succour in the present geopolitical context. As the US, Britain and France lurch towards cultural isolation and the old Anglo-American order disappears as if it were a fevered court masque dream, this play’s artful message of peaceful spirits vanquishing macho power and violence is apt. Shakespeare is ubiquitous, but his 40 or so plays will easily be around for another 400 years and beyond. These are stories for the ages about the human condition, with tales of love, war and mad ogres taking control that will forever be malleable towards the contemporary. Sure, he didn’t write many great roles for women – about 160 women and girl parts in his cannon, all played by men and boys on the Elizabethan stage, compared to about 1000 male roles – but this problem can be overcome with some sly and effective cross-gender casting. It’s Shakespeare’s final plays, however – Cymbeline, The Winter’s Tale and The Tempest – that knit together a desire for peace after the murder and mayhem of what has gone before. 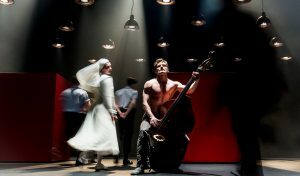 Soon, as evidence of the playwright’s ongoing multilingual omnipresence, Australian audiences will see on stage Shakespeare in Russian: Measure for Measure at Sydney Festival in January, toured by London’s Cheek by Jowl company in association with the Moscow-based actors of Pushkin Theatre. Then, in German: a Richard III from Berlin’s Schaubühne Theatre at Adelaide Festival in March, that makes a rock star and stand-up comedian of a moral monster, with drumming and rapping. At the same time, one of our own very good Shakespearean actors, Kate Mulvany, for those who recall her Lady Macbeth, will be at Sydney Opera House followed by Canberra and Melbourne, playing a rival Richard III in the original English, making use of the bodily scars of her own rare childhood kidney cancer to play out the king’s mythical hunchback disability for Bell Shakespeare. Mulvany has the perfect cross-gender role model in Glenda Jackson, who recently returned to the stage after 25 years, playing King Lear at London’s Old Vic theatre. I saw Jackson’s awesome performance last month, at age 80, imbued with such power and conviction and humanity. She deserved her standing ovation. It’s Shakespeare’s final plays, however – Cymbeline, The Winter’s Tale and The Tempest – that knit together a desire for peace after the murder and mayhem of what has gone before, including the psychological torment of Lear and that Scottish play thespians are often too superstitious to name. 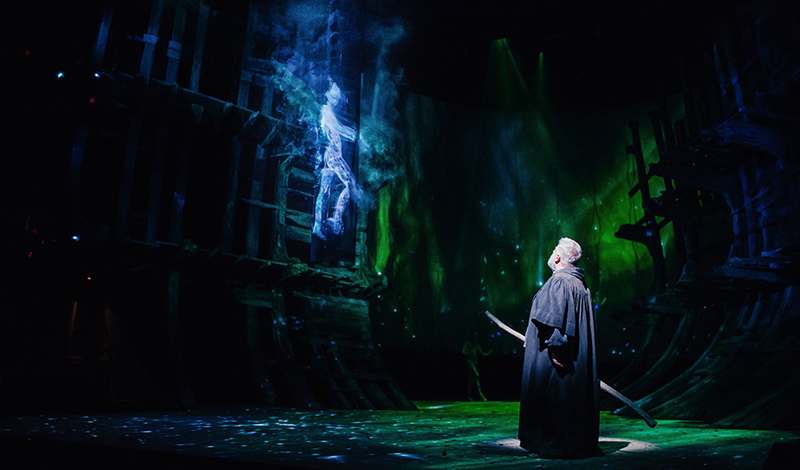 Sitting opposite me two days after opening night of The Tempest, the esteemed Shakespearean actor Simon Russell Beale tells me Prospero’s final speech after losing his magic is the playwright saying “please, please stop, someone has to cut this chain of revenge and [violent use of] power”. Shakespeare’s observations on power retain their potency, but the artistic director of Cheek by Jowl company, Declan Donnellan, tells me a few days later in London over a cup of chamomile that it’s too glib to liken the Bard’s kings, queens and dukes to specific contemporary leaders. It might be politically difficult for the Russian actors of Moscow’s Pushkin Theatre – who are bringing Measure for Measure, the story of a judge, Angelo, given power over Vienna, to Sydney Festival – to directly satirise their own leaders, Donnellan concedes, but that would be a naive approach to Shakespeare anyway, he says. Shakespeare presents us not simply with the darkness in our leaders, but darkness in ourselves. Richard III, as portrayed by Lars Eidinger of Schaubühne Theatre, is commonly called a moral monster, director Thomas Ostermeier tells me on the phone from Berlin, but his behavior is a product of a “rotten, corrupted and violent society”. Scholars believe Elizabethan actors communicated directly to the audience, which is why Eidinger is in the face of and engaging with theatregoers, eschewing the psychological realism we are used to in most movies and theatre. This “outsider with a rock star appeal and a certain amount of rage inside him” seems terribly contemporary given the US election result. What does Richard III have to say when the world is becoming more nationalist and isolationist through Farage, Trump and Le Pen? Therein lies the fundamental truth: Shakespeare is still relevant because he presents us all with our dual deepest humanity and darkest possibilities. Measure for Measure is at Roslyn Packer Theatre, Sydney from 7 January; Bell Shakespeare’s Richard III at Sydney Opera House from 25 February, Canberra Theatre Centre from 6 April and Arts Centre Melbourne from 20 April; Schaubuhne Theatre’s Richard III is at Her Majesty’s Theatre Adelaide from 3 March; and Royal Shakespeare Company’s The Tempest will screen in select cinemas from 4 March. 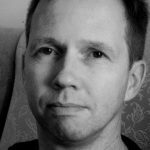 Steve Dow is an arts journalist who writes for publications including The Saturday Paper, Guardian Australia, Sunday Life, and The Monthly. They didn’t have social media in 1616! Yep. They had to wait until the 1650s for the first coffeehouses to open for a good gossip.